RainSaucer - How do I deal with Algae in my Rain Barrel? If you are using a white colored drum, IBC Tote, or bucket as a rain barrel and you are concerned about algae, you have three very simple choices for how to deal with it. The first is to do nothing- based on the premise that the water is for gardening and not for human or animal consumption. 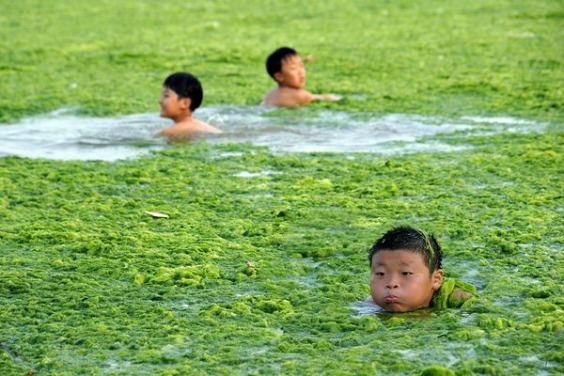 Algae will not hurt your plants because algae is a plant itself. The second is to block out the light that is entering the unit. Algae needs sunlight to flourish so take away the exposure and the algae will dissipate. The most common way to block out light is to paint the outside of the barrel a dark color with Krylon fusion paint which is optimized for plastic. Another possibility is to wrap the barrel in plastic sheeting. The third choice is to move the water into the shade. This is clearly not practical for 55 gallon drums. But if you are collecting rainwater on a smaller scale for potable drinking water purposes (algae can be harmful to animals and humans when consumed), keeping the water cool and dark will be your best method of preservation anyway.